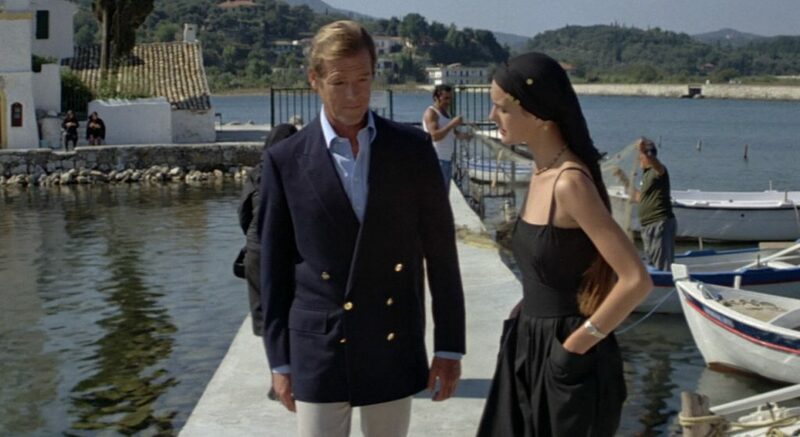 In For Your Eyes Only, Bond wears a double-breasted navy blazer made by Douglas Hayward when out in Corfu. The blazer is likely made of worsted wool serge, a common material for blazers and a material used for military uniforms. There are six buttons on the front in a button two, show three configuration, with polished brass buttons. The button stance is quite low, with the middle buttons placed almost as low as the bottom buttons typically are on a classic double-breasted coat. This style gives the coat a longer lapel line whilst keeping the classic six-button arrangement, though the blazer has odd proportions and looks a little sloppy around the waist. The blazer has soft shoulders with roped sleeve heads, a draped chest and medium-width peaked lapels. Both lapels have a buttonhole. The jacket has double vents, flapped pockets and three cuff buttons. The stone-coloured gabardine trousers are cut with a wide straight leg. The light blue shirt made by Frank Foster has a placket front with stitching close to the centre, a spread collar and two-button mitred cuffs. 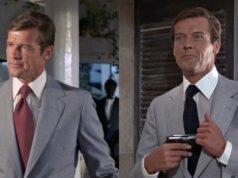 Bond wears the shirt without a tie, leaving the collar and first button open. His shoes are dark brown slip-ons. The Frank Foster shirt was auctioned at Prop Store on 16 October 2014 for £1,200. Brosnan wears a navy double breasted blazer with a similarly coloured shirts and trousers in Goldeneye, although the jacket remains open throughout. The last time Bond's worn a blazer. I think in recent years they've fallen out of fashion. 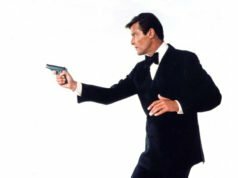 Moore seemed to like them a lot and his last Hayward made blazer we see, very briefly, in A View to A Kill. This is single breasted (navy I think) and worn with, I seem to recall, a burgundy colour, cravat/ascot. Brosnan, again in Goldeneye, was the only otherBond to wear this choice of neckwear. Anyone got an opinion on this? With all due respect to the low button stance, it simply doesn’t work here. It looks like a 4-button DB jacket with two extra buttons sewn onto it. I have to agree with KK – one of Sir Roger’s few fashion “misses”. Are you quite sure the trousers here are absolutely straight-leg in their cut, Matt? I’d say they were very mild wide leg – perhaps 1″ wider in diameter than the knee. Nothing obtrusive, but just enough to balance out the upper half of the trousers. My own preference for trousers are cut as I describe above, and the extra inch that makes up the wide leg is generally unnoticeable. It isn’t so painfully obvious as the cut used throughout TSWLM. Last screenshot also shows a slight guardsman’s cut to the trousers to minimize the break; again, nothing like TSWLM; more likely not more than 1/2″ or 1″ difference in the length of the hem. This blazer looks fuller cut then many of Moore’s other famous blazers. Usually his blazer’s have more shape around the waist, across all his tailor’s, What do you think was the reason for this Matt ? Hayward may have wanted this blazer to look more casual. Yes, that is a possibility as it is a very casual setting. The blazer still has standard flapped pockets, which are more formal. Hayward rarely used patch pockets on his blazers and he never used flapped patch pockets as far as I’m aware. The low button stance alone makes the blazer look very relaxed.